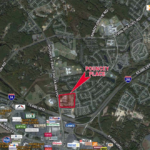 Pouncey Place is a 10-acre parcel strategically located at the intersection of Pouncey Tract Road and Twin Hickory north of the Short Pump area. It is the last commercially zoned parcel north of Interstate 64 in Short Pump, abutting a significant residential area in Western Henrico. Pouncey Place is across Pouncey Tract Road from Short Pump Manor at Bacova, which comprises 95 homes on 27 acres that are priced from the upper $440,000s to the upper $590,000s. It is also adjacent to the Townes of Pouncey Place and Twin Hickory residential communities which comprise over 2,000 homes.